Latest jQuery Plugins for designers & developers. Today I selected fresh jQuery plugins which can help to develop your project must faster and easier. The plugins are sliders, image galleries, slideshow plugins, responsive html, mobile interfaces, tooltips plugins, social network widgets and many other useful jQuery Plugins collected all in one place. FooTable is a jQuery plugin that aims to make HTML tables on smaller devices look awesome – No matter how many columns of data you may have in them. The plugin auto-hides the selected columns on each breakpoint defined and users won’t need to scroll horizontally. Any List Scroller is a jQuery plugin that can perform the scrolling with any list and in any dimension. Vegas is an amazing jQuery plugin for creating fullscreen background slideshows for web pages. ayaSlider is a flexible jQuery slider plugin with a very simple usage and setup. The slider can display an unlimited number of items where any HTML can be used for the slides. 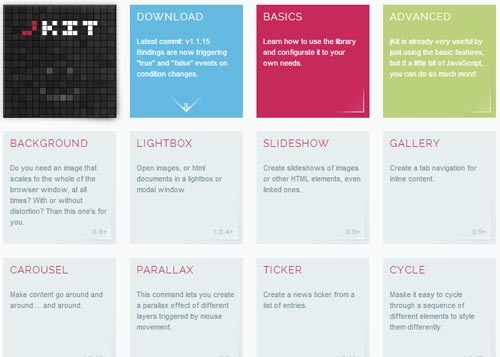 jKit is a free user interface library for jQuery that offers lots of functional features and components. It works cross-platform and includes slideshow, tabs, accordion, parallax, zoom, tooltip, form handling, ticker and much more. 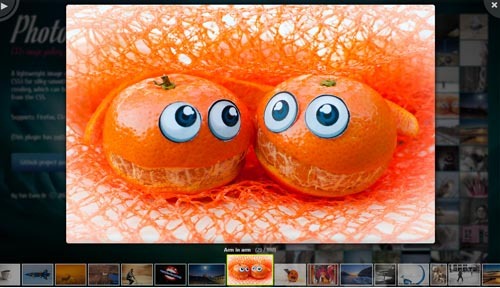 Photobox is a beautiful and posses a great look jQuery image gallery that uses CSS3 transitions and animations. The gallery is lightweight and presents the items as a wall where each item can be viewed inside a modal box. SocialCount, a jQuery plugin, with only 3kb in size and provides a much lighter solution for them. Social Networking widgets are a digital blot on the beautiful canvas we call the web. They often do not (with intent) blend with a site’s design or with each other.